This species is new to 365 days but is a very rewarding small species with relatively large deep red striped flowers. 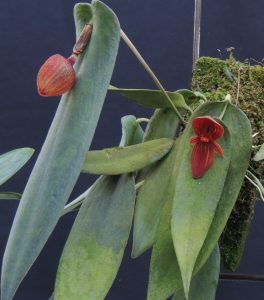 Pleurothallis lynniana is endemic to Ecuador and we find it grows well in deep shade on a north facing wall in our Cool Americas section. We grow the species mounted which suits its growth habit which is horizontal to pendulous. Flowers form from the leaf axils and leaves bloom successively over a very long period. With just over a week to go until we host the British Orchid show we have been working hard to prepare the greenhouses for hundreds of visitors each day and we are really looking forward to sharing our plants with the public.